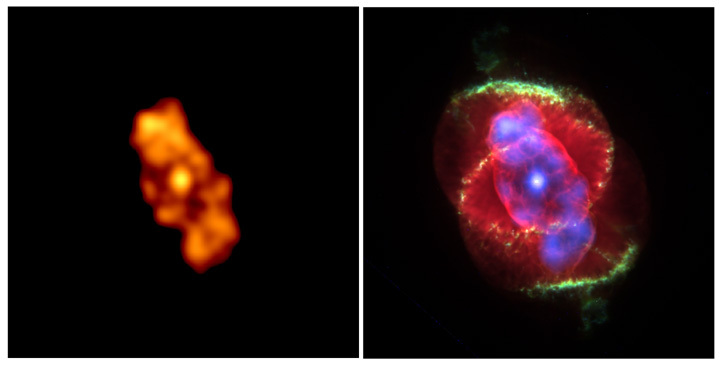 Left image: The X-ray data from the Chandra X-ray Observatory have revealed a bright central star surrounded by a cloud of multimillion-degree gas in the planetary nebula known as the Cat's Eye. This Chandra image, where the intensity of the X-ray emission is correlated to the brightness of the orange coloring, captures the expulsion of material from a star that is expected to collapse into a white dwarf in a few million years. The intensity of X-rays from the central star was unexpected, and it is the first time astronomers have seen such X-ray emission from the central star of a planetary nebula. 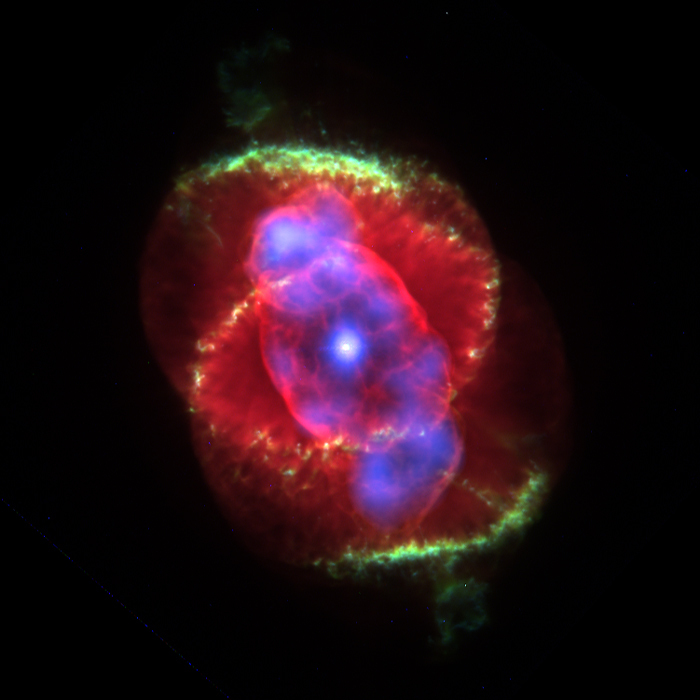 The ACIS X-ray camera aboard Chandra observed NGC 6543 on May 10-11, 1999, for a total exposure time of 46,000 seconds. Right image: This composite image of Chandra and Hubble Space Telescope data offers astronomers an opportunity to compare where the hotter, X-ray emitting gas appears in relation to the cooler material seen in optical wavelengths. The Chandra team found that the chemical abundances in the region of hot gas (its X-ray intensity is shown in purple) were like those in the wind from the central star and different from the outer cooler material (the red and green structures.) Although still incredibly energetic and hot enough to radiate X-rays, Chandra shows the hot gas to be somewhat cooler than scientists would have expected for such a system. These results present a puzzle since the temperature of the X-ray emitting material suggests that mixing might have occurred. This discrepancy means some other process has created the "lukewarm" X-ray emission observed by Chandra. The color composite of optical and X-ray images was made by Zoltan G. Levay (Space Telescope Science Institute). The optical images were taken by J.P. Harrington and K.J. Borkowski (University of Maryland) with the Hubble Space Telescope.